convo . . Wallpaper and background images in the Harry Potter Vs. Twilight club tagged: harry potter twilight edward potter. ^ Agreed. Mean Girls is epicness. lmao that was good. I liked Voldemort's comment but Edward should go home, and why didn't anyone mistake him for Cedric with his profile picture? Edward needs to go back to his own school! 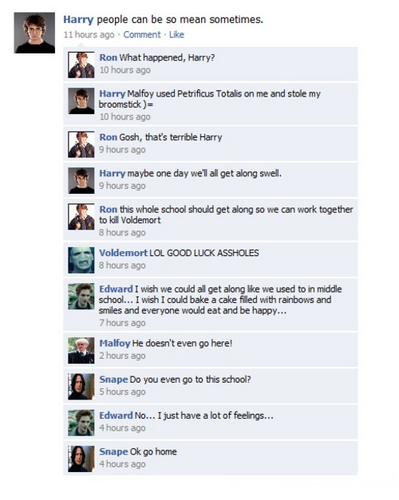 priceless .. i laughed my brains out because of voldy and snape's comments ..